In this solo cooking adventure, Gary makes a seasonal pasta dish that’s enhanced by the addition of prosciutto. When I first moved back home after college, there was a period of adjustment – I had been used to living with friends and now I was living where I grew up with my family. Readjusting to the family dynamic was difficult enough but having to eat the same Chinese food over and over again was torture. Not to say that what my parents made at home was bad but after being used to deciding what I wanted to eat while away at school and now eating as the ‘rents dictated caused a minor bout of rebellion on my part. Not that I could do much about it – it was, after all, their kitchen so I never felt comfortable making anything adventurous (I know that sounds weird but that’s my relationship with my parents for ya). When I was able to find time in the kitchen, which wasn’t often since I worked and my cooking would time away from when dad could be cooking, I tended to stick to safe meals that would require as little time as possible. One such dish was a pasta dish that JP and I would make in our college apartment – essentially some pasta and vegetables cooked in plenty of olive oil for flavor. What really made the dish a hit was the addition of prosicutto – crisping it in the olive oil before adding everything else to the pan ensured that everything would get a little hint of pork flavor. It was always a hit when we made it then so it was something that made it to my repertoire when I moved back home. I even made it for my mother who thought I’d learn to cook but was surprised that I could make something that wasn’t bad (okay, she liked it – I’m just taking creative license, making her seem worse than she really is). Over the years, I’ve adapted the dish over many times using different types of pasta. I’ve mostly made it with penne or rotini but I’ve been known to throw in ziti and rigatoni every now and then depending on what was in the cupboards. 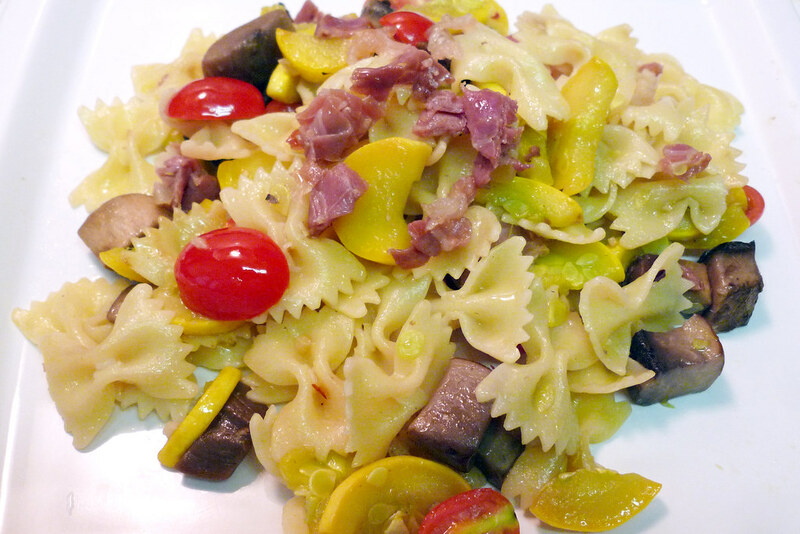 For this recipe, I chose to go with farfalle, reasoning that their size and shape would pair very well with my choice in vegetables. Speaking of vegetables, that’s also part of the dish that’s in flux, owing to the changing seasons. Since it’s summer now, what better vegetable really than summer squash? Sliced and then cut in half into semi-circles, they pretty much take up the same amount of area as the farfelle, making for balanced forkfuls of pasta and vegetable. For good measure, there’s also some diced up portobello mushrooms to provide some more sustenance and halved grape tomatoes to bring a little acid to the party. Bring a large pot of water to a boil and salt it. Add the farfalle and cook to al dente according to the directions on the package. Salt the squash slices and wrap in paper towels. Let it sit for 30 minutes so water can be drained from them. In a pan, heat 1 to 2 tablespoons of olive oil over medium heat. Cook the squash in the pan until soft, then remove and set aside. Cook the portobello mushrooms in the same pan, again until soft, then remove, being careful not to transfer any of the blackened water with the mushrooms, and set aside. Heat olive oil in a large pan over medium high heat. Add garlic and cook until fragrant. Add prosciutto to the pan, cooking until crisp. Add the squash and portobello mushrooms. Cook until both are warm. Drain farfelle and add it to the pan. 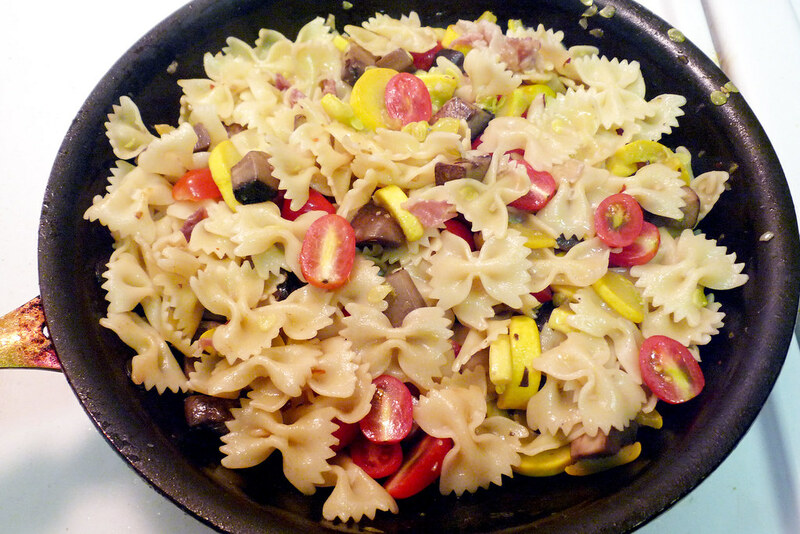 Toss gently to evenly distribute the pasta and the vegetables. Remove from heat and add the tomatoes. Salt and pepper to taste, then toss gently again to evenly distribute. 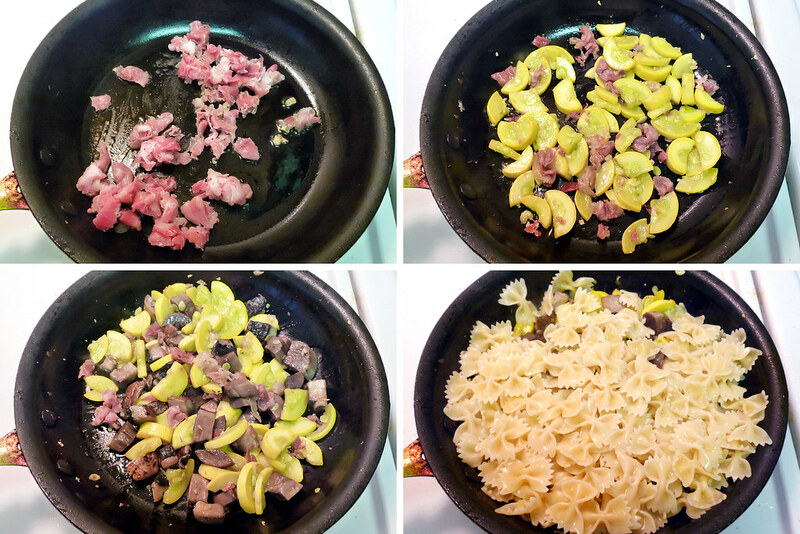 Divide pasta evenly among four plates. Drizzle olive oil over top and serve.